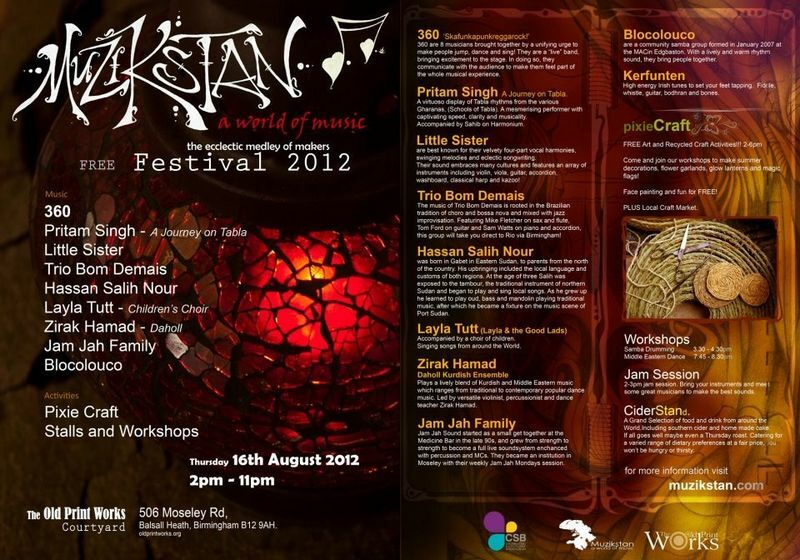 The inaugural Muzikstan Festival 2012 is due to take place in Birmingam, UK, next week (Thursday 16th August, 2pm-11pm) showcasing a world of music from some of the amazing wealth of world musicians based in the British Midlands. Four hours of world music from cultures as diverse as India, Kurdistan, Sudan, Jamaica, Brazil and the British Isles. Muzikstan, is an atmospheric bohemian treat which has been blessing those fortunate enough to be in the know about Birmingham’s newest acoustic music lounge. Bi-weekly for the last five months, The Old Print Works (Moseley, Birmingham) has been supporting Muzikstan in their quest to bring music from around the world, up close and personal. In the cosy candlelit venue you’d be excused for making yourself at home, kicking back and enjoying a live introduction to some of the quirkiest and talented musicians around. 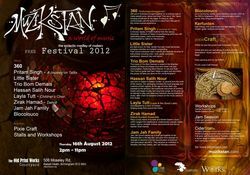 Continuing the Thursday night tradition, Muzikstan Festival 2012 will be a musical bonanza not to be missed. It is rare that such a worldly eclectic ensemble of talent play for free, at one event. With back to back performances there will be the joys of ten Muzikstan sessions in one. The intimate mood of appreciation will be extending into The Old Print Works Courtyard, and while the Bedouin inside-outside lounge will encourage you to sit back and smile, the music will make want to get up and dance. With freestyle jamming, interactive workshops welcoming children and families, culinary delights to indulge in and not forgetting the united nations of music, there will be something for everyone. Muzikstan will take you on a musical world tour experiencing the traditional roots and rhythms of Brazil, India, Africa and the Middle East via Birmingham’s finest ska and reggae. Best known for their velvety four-part vocal harmonies, swinging melodies and eclectic songwriting. Their sound embraces many cultures and features an array of instruments including violin, viola, guitar, accordion, washboard, classical harp and kazoo! Rooted in the Brazilian tradition of choro and bossa nova and mixed with jazz improvisation. Featuring Mike Fletcher on sax and flute, Tom Ford on guitar and Sam Watts on piano and accordion this group will take you direct to Rio via Birmingham! Born in Gabet in Eastern Sudan, to parents from the North of the country, his upbringing included the local language and customs of both regions. At age three Salih was exposed to the tambour, the traditional instrument of northern Sudan, and began to play and sing local songs. As he grew up, he learned to play oud, bass and mandolin, playing traditional music, after becoming a fixture on the music scene of Port Sudan. Muzikstan's very own host and organiser Zirak Hamad with the Daholl Kurdish Ensemble. A lively blend of Kurdish and Middle Eastern music which ranges from traditional to contemporary popular dance music. Led by versatile violinist, percussionist and dance teacher Zirak Hamad. Started as a small get together at the Medicine Bar in the late 90s and grew from strength to become a full live sound system enhanced with percussion and MCs. They becane an institution in Mosely with their weekly Jam Jah Mondays sessions. High energy Irish tunes to set your feet tapping - fiddle, whistle, guitar, bodhran and bones. Come and join our workshops to make summer decorations flower garlands, glow lanterns and magic flags! Face painting and fun for FREE! 2pm-3pm jam session . Bring your instrument and meet some great musicians to make the best sound of music around the World. There will also be Pixie craft, drumming and dance workshops.